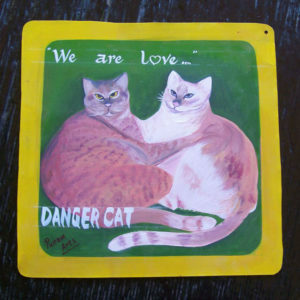 Folk art Ginger Cats hand painted on metal by sign painters from the Nepal Himalayas. 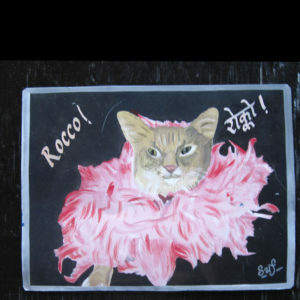 Folk art portrait of Cooper the Ginger Cat hand painted on metal by the sign painter Punam. Cooper looks great in this larger than normal portrait of a pretty pussycat. 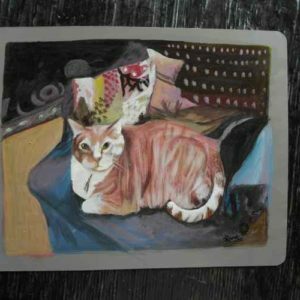 Scooter and Cheeto make a cute pair in this hand painted portrait by Punam. 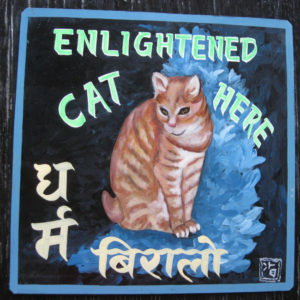 This big old Ginger Tom Cat is very handsome in his portrait by the artist Baba, a sign painter in Kathmandu. 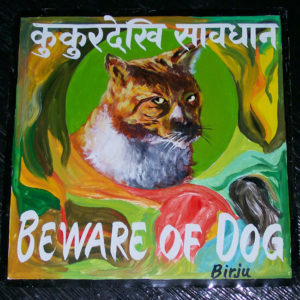 This sign was meant to say ‘Beware of Dog’ as this rather ferocious looking ginger cat is named Augey Doggie. 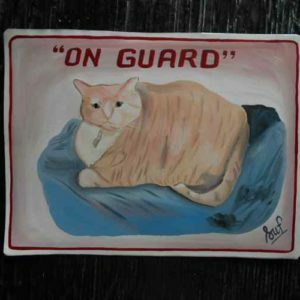 This cat’s name is Auggie Doggie and the owner requested it to say ‘Beware of Dog’. 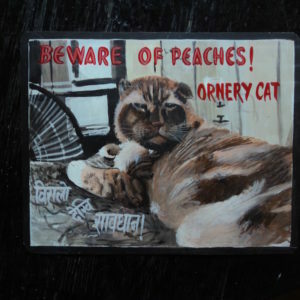 Sanjib Rana hand painted this Ginger Cat using acrylic paint on metal. 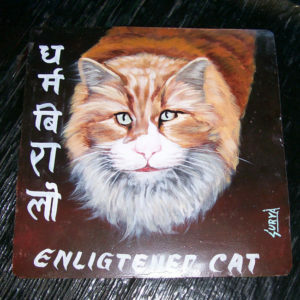 Folk art portrait of Cooper the Ginger Cat hand painted on metal by Sanjib Rana, a Nepali artist. 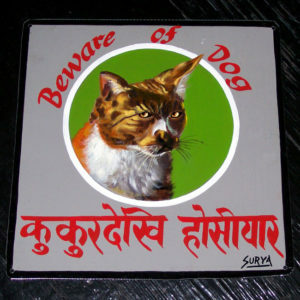 Folk art Beware of Cat Nolo is ‘On Guard’ is his portrait by Sufraj Khadka. This one is a little smaller than normal. 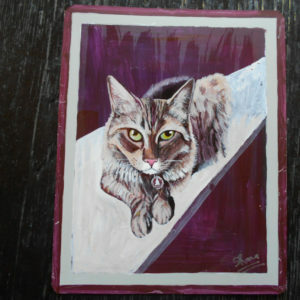 Megh Raj Thapa painted the Ginger Kittens Red and Alexander. 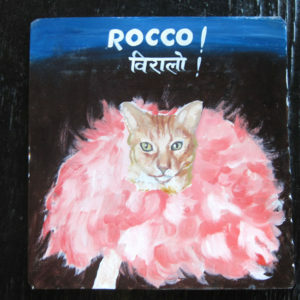 This version of the cats is sweet and well painted against a grassy background with blue skies overhead. 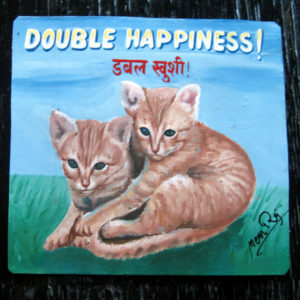 These kittens bring ‘Double Happiness’ indeed. 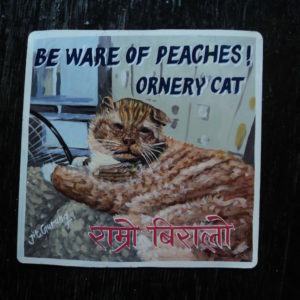 Hand painted on metal by Sagar, this orange tabby cat is very pretty against her dark blue background with a flutter of light blue behind. 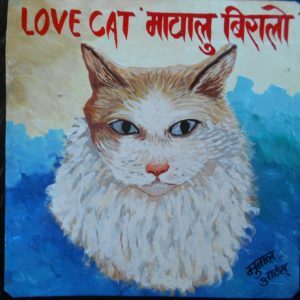 Oliver the Love Cat is hand painted by Jit Gurung. 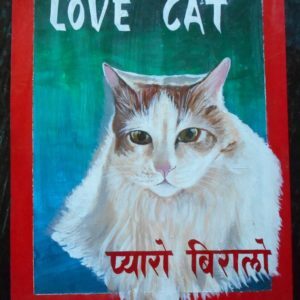 Jit is an illustrator as well as a sign painter in Pokhara, Nepal. Oliver the Love Cat is a ginger and white long haired domestic cat. Sanjib Rana uses acrylic paint for his portraits so this one is for indoor use only. All other artists use synthetic enamel paint and are good for indoors and out. 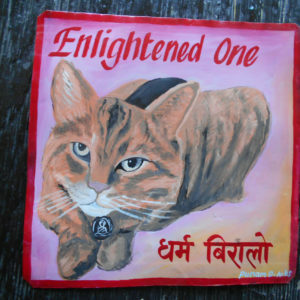 Folk art portrait of a ginger cat hand painted in Nepal.